"Field Goal" redirects here. For the video game, see Field Goal (video game). For other uses, see Goal (disambiguation). Peter Bondra scoring a goal in ice hockey. In sports, a goal is a physical structure or area where an attacking team must send the ball or puck in order to score points. In several sports, a goal is the sole method of scoring, and thus the final score is expressed in the total number of goals scored by each team. In other sports, a goal may be one of several scoring methods, and thus may be worth a different set number of points than the others. The structure of a goal varies from sport to sport. Most often, it is a rectangular structure that is placed at each end of the playing field. Each structure usually consists of two vertical posts, called goal posts, supporting a horizontal crossbar. A goal line marked on the playing surface between the goal posts demarcates the goal area. Thus, the objective is to send the ball or puck between the goal posts, under or over the crossbar (depending on the sport), and across the goal line. Less commonly, as in basketball or netball, goals are ring-shaped. The structure is often accompanied with an auxiliary net, which stops or slows down the ball when a goal is scored. In some sports, the goal is the sole method of scoring. In these sports the final score is expressed as the number of goals scored by each team, with the winner being the team that accumulated more over the specified time period. In this example Sydney scored 10 goals (at six points each) and 4 behinds (one point each) for a total of 64 points. Brisbane scored 9 goals and 12 behinds for a total of 66 points. Despite having fewer goals, Brisbane won the game. Other sports may use multiple methods of scoring, with the points earned for each type of score varying. In these sports, the object of the game is to score a greater number of total points than the opponent. Scores are expressed solely as numbers of points. In many games, at each end of the field of play, there are two vertical posts (or uprights) supporting a horizontal crossbar. In some games, such as association football or hockey, the object is to pass the ball between the posts below the crossbar, while in others, such as those based on rugby, the ball must pass over the crossbar instead. In Gaelic football and hurling, in which the goalposts are similar to those used in rugby, the ball can be kicked either under the crossbar for a goal, or over the crossbar between the posts for a point. The vertical supports are usually called goal posts and the horizontal top is usually called the crossbar. A goal in these games normally requires that the ball or puck be sent between the posts, under the crossbar and completely behind the goal line. 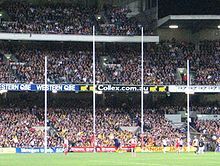 In Australian rules football, there is no crossbar but four uprights instead. In netball, a single post at each end of the court supports a horizontal hoop that the ball must fall through. In basketball, the hoop and net used for scoring can be supported on a post or mechanism at each end, or in smaller buildings attached directly to the wall. The goal is the only method of scoring in several games. In each of these cases the winner is the team that scores the most goals within the specified time. In association football the goal is the only method of scoring. It is also used to refer to the scoring structure. An attempt on goal is referred to as a "shot". To score a goal, the ball must pass completely over the goal line between the goal posts and under the crossbar and no rules may be violated on the play (such as touching the ball with the hand or arm). See also offside. The goal structure is defined as a frame 24 feet (7.32 m) wide by 8 feet (2.44 m) tall. In most organized levels of play a net is attached behind the goal frame to catch the ball and indicate that a goal has been scored; but the Laws of the Game do not mandate the use of a net and only require that any net used not interfere with the goalkeeper. A goal in handball is scored when the ball is thrown completely over the goal line, below the crossbar and between the goal posts. The goal structure in team handball is 2 metres high and 3 metres wide. A net is required to catch the ball. Hungarian players prepare to defend their goal against a Canadian corner-stroke at the 2012 Bandy World Championship. The goal-keeper has a different colour on his jersey, here grey. In hockey, a goal is scored when the ball or puck passes completely over the goal line under the crossbar and between the goal posts, after being shot from with a semicircle 14.63 metres (48.0 ft) from the goal. The goal structure in field hockey is 3.66 metres (12.0 ft) wide by 2.14 metres (7.0 ft) tall. Nets are required to hold the ball in. Similarly, in ice hockey, scoring a goal is similar to scoring a goal in football. The puck must be put completely over the goal line between the posts and under the bar either off an offensive player's stick or off any part of a defensive player's body. The puck may not be kicked, batted, or thrown into the goal, though a goal may be awarded if the puck is inadvertently deflected off an offensive player's skate or body into the goal. The goal structure is a frame 4 feet (1.2 m) tall and 6 feet (1.8 m) wide with a net attached. In most higher levels of play the goal structure is attached to the ice surface by flexible pegs and will break away for safety when hit by a player. The goal is placed within the playing surface, and players may play the puck behind the goal. Another similarity is in bandy, which has much of its structure from association football. Like in association football, the only way of scoring in bandy is to make a goal and the goal is also used to refer to the scoring structure. If neither of the teams has scored during a match, or if both teams have made the same number of goals, there is a draw. If not otherwise decided in the Bandy Playing Rules set up by the Federation of International Bandy, an approved goal is made when the ball is played in a regular manner and the whole ball has passed the inner definition of the goal line between the two goal posts and the cross-bar. This is stated in section 9 of the Rules. A goal can be made directly from a stroke-off, penalty-shot, a free-stroke, a face-off or a corner stroke. Centered at each short-line of the bandy field is a 3.5 m (11 ft) wide and 2.1 m (6 ft 11 in) high goal cage, regulated to size, form, material and other properties in section 1.4 of the Bandy Playing Rules. The cage has a net to stop the ball when it has crossed the goal-line. The cage shall be of an approved model. In front of the goal cage is a half-circular penalty area with a 17 m (56 ft) radius. A penalty spot is located 12 metres (39 ft) in front of the goal and there are two free-stroke spots at the penalty area line, each surrounded by a 5 m (16 ft) circle. Lacrosse goals are scored when the ball travels completely past the goal line. Goals can be disallowed if there is an infraction by the offensive team. The goal in lacrosse is 6 feet (1.8 m) tall and 6 feet (1.8 m) wide and a net is used to prevent the ball from reentering the field of play. Lacrosse goals are not positioned on the end boundary line, play often occurs behind the goal. In netball, a goal is scored when the ball is shot through a goal ring on a pole. In polo, a goal is scored if the ball passes completely between the goal posts, regardless of how far off the ground the ball is. The ball must be between the goal posts or the imaginary lines extending above the inside edges of the posts. A ball passing directly over a goal post does not score a goal. The goal structure in Polo consists of two poles, at least 10 feet (3.0 m) high and exactly 8 yards apart. There is no crossbar and no net is required. The height at which a goal may be scored is infinite. In shinty, a goal is scored if the ball goes over the goal line and under the crossbar. A goal can only be scored with a stick called a "caman"; no goal is scored if the ball is kicked, carried, or propelled by an attacking player's hand or arm. A goal in water polo is scored when the ball passes completely across the goal line, under the crossbar and between the goal posts. A goal may be scored through contact with any part of the attacker's body except a clenched fist. The goal structure in water polo is dependent upon the depth of the water. The goal mouth measures 3 metres across and is either 0.9 metres above the surface of the water or 2.4 metres above the floor of the pool, whichever is higher. Nets are required. The following games have more than one possible method of scoring where the goal is the primary method, i.e. the method that scores the most points. In most cases the score is shown as the number of goals, plus the number of secondary scores (usually 1 point), plus the total number of points. The side with the higher number of total points is the winner. In Australian rules football a goal is scored when the ball is kicked by an attacking player completely between the two tall goal posts. To be awarded a goal, the ball may not contact or pass over the goal post, touch any player on any part of the body other than the foot or lower leg of an attacker. In such cases, the score is a behind (1 point). The ball may be punted, drop kicked, or kicked off the ground (soccered). The ball may cross the goal line at any height from ground level up and may bounce before crossing the line. A goal scores six points and is the object of the game. The minor score of one point is used as a tiebreaker. The behind, which scores one point; is awarded if the ball passes between the point posts or is not awarded a goal by the above provisions when passing through the goal posts. The goal structure consists of two posts at least 6 metres in height and spaced 6.4 metres apart. There is no crossbar and no net. The primary object of basketball is to score by shooting (i.e., throwing) the ball into a goal officially called the basket. A basket is scored when the ball passes completely through the basket ring from above; however, the number of points scored with each basket depends on where on the court the ball was shot from, and a team does not necessarily need to score the most baskets to win the game. Basketball scores are expressed in total points. A basket scored during normal play is called a field goal and is worth two points if shot from within or on the three-point line, and three points if shot from beyond the three-point line. The three-point line's distance from the basket varies by level. Points are also awarded to the shooting team if the defensive team commits goaltending or basket interference while the ball is in flight towards the basket or is directly over it. A basketball team can also score by free throws, which score one point each. Free throws are awarded to a team after the opponent commits a foul in certain scenarios. The player taking the free throws (usually the player who was fouled) is entitled to take a specified number of shots unopposed with both feet behind the free throw line. The basket consists of a metal ring 18 inches (46 cm) in internal diameter, suspended horizontally 10 feet (3.0 m) above the floor such that the center of the ring is equidistant from each sideline and 5 feet 3 inches (1.60 m) from the end line. The basket ring has a net attached below to briefly check the ball's downward progress and indicate a score. The ring is fastened to a rectangular backboard 6 feet (1.8 m) wide by 3.5 feet (1.1 m) tall, though in lower levels of play or recreational use the backboard may be smaller and/or fan-shaped. The entire structure is supported from behind and anchored to the floor beyond the end line at higher levels of play; the structure may be anchored to a wall or ceiling at lower levels of play. The ring, net, and the front, top, bottom, and sides of the backboard are all considered inbounds, while the back of the backboard and the support structure – even those parts suspended over inbounds areas of the court – are considered out of bounds. 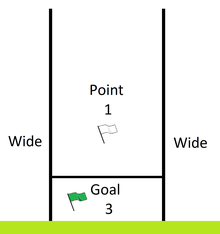 Goalposts and scoring system used in hurling, Gaelic football, camogie and ladies' Gaelic football. The posts are 6.5 m (21 ft) apart with a crossbar 2.5 m (8 ft 2 in) high. In Gaelic football a goal is scored when the ball passes completely beyond the goal line, between the goal posts and under the cross bar. The ball can be played with the hands, but a goal cannot be scored by a handless. A ball travelling between the goal posts and over the cross bar is awarded one pointed called an "over". Overs are the most common scoring method with goals heavily defended. A goal is worth three points. In hurling the ball must pass completely beyond the goal line. The ball may be played by any legal method except by the hand of the attacker. A ball in flight may be deflected into the goal off the hand of an attacker. Hurling and Gaelic football use the same goal structure. It is a 6.4 meter wide frame with a net attached. The goal posts are at least 6 meters high, and the crossbar is 2.44 meters above the ground. A goal is scored when the ball crosses below the crossbar and a point is scored when the ball passes above it. A field goal in American or Canadian football is a secondary method of scoring; it is scored when the ball is place kicked or drop kicked completely over the crossbar and between or directly over the goal posts. A field goal scores 3 points in both versions of the sport. In the American game, the now rarely used fair catch kick, if successfully made, also scores 3 points. A goal kicked during a try following a touchdown is worth one point. These are the only methods of putting the ball through the goal that award points to the kicking team; no points are scored if the ball is punted or thrown through the goal, or if the ball goes through the goal on a kickoff (except, in the latter case, in indoor American football, where some leagues award a single point). In both sports, the goal structure consists of a crossbar suspended 10 feet (3.0 m) off the ground and goal posts (colloquially known as "uprights") placed 18 feet 6 inches (5.64 m) apart and extending at least 35 feet (11 m) above the crossbar. In lower levels of play the goal posts may be placed further apart and/or not extend as far above the crossbar; for example, in high school football the posts are 23 feet 4 inches (7.11 m) apart. NFL and CFL rules mandate that a ribbon be attached to the top of each goal post. Goals are centered on the field, but on different lines: in American football, they lie on the "end line" (far end of the end zone) and in Canadian, on the "goal line" (beginning of the end zone). A retractable net may be placed behind the goal, well beyond the field of play, to prevent the ball from entering spectator areas. 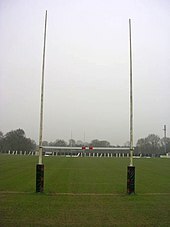 Until 1967 in the NFL, the goalposts were similar to rugby posts and were located on the goal line. Similarly, in arena football, the field goal is similar to that in American and Canadian football. A field goal in arena football scores three points, unless it is drop kicked, in which case it scores four points. The goal structure in arena football is much smaller than the outdoor game; it consists of a crossbar 15 feet (4.6 m) above the playing surface and 9.5 feet (2.9 m) wide; this size is also used for most other indoor leagues as well. Uniquely in arena football, the goal posts are attached to nets on either side of the crossbar which are taut to allow the ball to rebound back onto the field of play. The nets are 30 feet (9.1 m) wide and 37 feet (11 m) high. These nets do not represent a scoring area, but keep the ball in play and prevent it from entering the crowd. Canadian football also offers a secondary form of goal, the rouge or single point; it is awarded if a ball enters the goal area (end zone) by way of any kick (either a missed field goal or a punt) and is not returned by the opposing team. A goal is scored in either rugby code by place kicking or drop kicking a ball over the crossbar and between the uprights of H-shaped goalposts. The crossbar is 3 metres (9.8 ft) from the ground; the uprights are 5.5 metres (18 ft) apart in rugby league and 5.6 metres (18 ft) in rugby union. Drop or field goal Drop 3 1 Scored from open play. Penalty goal Place or drop 3 2 Usually place-kicked. Conversion goal Place or drop 2 2 Usually place-kicked. Goal from mark Mark 3 3 Abolished in 1922 in league and 1977 in union. In the early years of rugby, only goals counted in scoring, and a "try" counted only if "converted" into a goal. The official name "goal from a try" for a converted try persisted until 1979. Celebrating the scoring of a goal is common. It is normally performed by the goalscorer, and may involve his or her teammates, the manager or coaching staff and/or the supporters of the team. Whilst referring to the celebration of a goal in general, the term can also be applied to specific actions, such as a player removing his shirt or performing a somersault. The expression "moving the goalposts", which means to make a set of goals more difficult just as they are being met, is often used in business but is derived from association football. It is commonly used to imply bad faith on the part of those setting goals for others to meet, by arbitrarily making additional demands just as the initial ones are about to be met. In business, the concept is more abstract, with some performance measure or target being set as a goalpost while achieving the target is often known as achieving a goal. ^ "Laws of the game (Law 10)". Federation Internationale de Futbol Associacion (FIFA). Archived from the original on 2008-04-21. Retrieved 2008-04-29. ^ "Laws of the game (Law 1)". FIFA. Archived from the original on 2008-03-22. Retrieved 2008-04-29. ^ a b "International Handball Federation: Rules of the Game" (PDF). International Handball Federation (IHF). Archived from the original (PDF) on 2008-04-14. Retrieved 2008-04-29. ^ a b "Rules of Hockey 2007-2008" (PDF). Fédération Internationale de Hockey sur Gazon (FIH). Retrieved 2008-04-29. ^ "Bandy Playing Rules" (PDF). Federation of International Bandy. 1 September 2011. Archived from the original (PDF) on 11 May 2013. Retrieved 8 March 2014. ^ "Men's Lacrosse 2017 and 2018 Rules" (PDF). National Collegiate Athletic Association. Retrieved 15 November 2017. ^ a b "Outdoor Rules" (PDF). United States Polo Association. Archived from the original (PDF) on September 29, 2011. Retrieved 2008-04-29. ^ a b "Laws of Australian Football: 2007" (PDF). Australian Football League. Archived from the original (PDF) on April 14, 2008. Retrieved 2008-04-29. ^ "Rule no. 5 – Scoring and Timing". National Basketball Association (NBA). Retrieved 2008-04-29. ^ "Rule no. 1 – Court Dimensions -- Equipment". NBA. Retrieved 2008-04-29. ^ a b "FIBA Official Basketball Rules 2010 - Basketball Equipment" (PDF). FIBA. Retrieved 18 October 2010. ^ a b "Official Guide 2003: Playing Rules, Hurling and Football" (PDF). Gaelic Athletic Association (GAA). Archived from the original (PDF) on 2008-04-10. Retrieved 2008-04-29. ^ "NFL Beginner's Guide to Football". National Football League (NFL). Retrieved 2008-04-29. ^ "NFL Digest of Rules: Field". NFL. Retrieved 2008-04-29. ^ "2010 Canadian Football League Rule Book" (PDF). Canadian Football League. Archived from the original (PDF) on 13 December 2010. Retrieved 8 December 2010. ^ a b "AFL 101". Arena Football League (AFL). Archived from the original on January 17, 2009. Retrieved 2008-04-29. ^ "1.4 Dimensions for goal posts and crossbar". Laws. World Rugby. Retrieved 30 November 2016. ^ "9.A SCORING POINTS". Laws. World Rugby. Retrieved 30 November 2016. ^ Safire, William. "On Language; Moving the Goalposts". nytimes.com. Retrieved 29 March 2018.